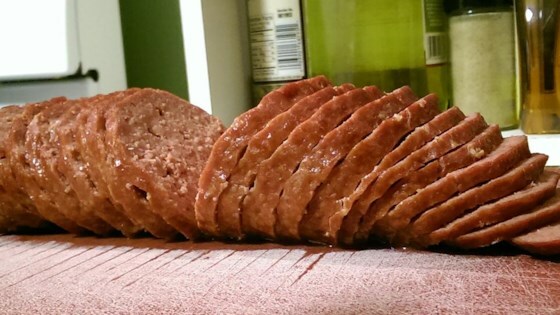 "This is the REAL homemade bologna and it is simply delicious! My Grandmother made this and gave the recipe to my Mom, and she gave it to me! You can say it is passed down! I am not a real big fan of Bologna, but once you taste this, you will love it all over again!" In a large bowl, mix together the ground beef, curing salt, water, garlic powder, onion powder and liquid smoke using your hands. Divide in half, and form each half into a roll. Wrap in plastic wrap, and refrigerate for 24 hours. Preheat the oven to 300 degrees F (150 degrees C). Unwrap the beef rolls, and place them on a greased baking sheet or roasting pan. Bake for 1 hour in the preheated oven, turning the meat over after 30 minutes. Cool to room temperature, then refrigerate until chilled. Slice, and eat on sandwiches. These authentic Mexican tamales are rich and satisfying. Tried this a couple of weeks ago. Although the over all flavor was good, it was VERY salty. Will try again with some modifications. This is more like a Summer Sausage. I, too added a little more cooking time and also reduced the salt a bit only as a matter of preference since I am not a big fan of salt. Very good flavor. My children usually do not like bologna. I put this recipe in cloth sleaves. It turned out fantastic. I added time onto the 200 degrees(about 1 1/2 hours). The recipe is gold!!! I found the texture was a bit 'chunky' so i tossed it all into my processor , not only did it mix it really well, it came out smooth. good flavor. Not the ideal lunch meat but awesome snack meat. Similar to deer bologna. Hard to screw this one up.